Madrid-based micromobility startup Movo has closed a €20 million (~$22.5M) Series A funding round to accelerate international expansion. The 2017-founded Spanish startup targets cities in its home market and in markets across LatAm, offering last-mile mobility via rentable electric scooters (e-mopeds and e-scooters) plotted on an app map. It’s a subsidiary of local ride-hailing firm Cabify, which provided the seed funding for the startup. Movo’s Series A round is led by two new investors: Insurance firm Mutua Madrileña, doubtless spying strategic investment potential in helping diversify its business by growing the market for humans to scoot around cities on two wheels — and VC fund Seaya Ventures, an early investor in Cabify. Both Mutua Madrileña and Seaya Ventures are now taking a seat on Movo’s board. Movo currently operates in six cities across five countries — Spain, México, Colombia, Perú and Chile. It first launched an e-moped service in Madrid a year ago, according to a spokeswoman, and has since expanded domestic operations to the southern Spanish coastal city of Malaga, as well as riding into Latin America. The new funding is mostly pegged for further international expansion, with a plan to expand into new markets in LatAm, including Argentina, Brazil and Uruguay. Movo is targeting operating in a total of 10 countries by the end of 2019. The Series A will also be used to grow its vehicle fleet in existing markets, it said. Flying cars definitely sound cool, but whether they’re actually a good idea is up for debate. Fortunately they do seem to have some surefire benefits, among which you can now count improved efficiency — in theory, and on long trips. But it’s something! Air travel takes an enormous amount of energy, since you have to lift something heavy into the air and keep it there for a good while. This is often faster but rarely more efficient than ground transportation, which lets gravity do the hard work. Of course, once an aircraft gets up to altitude, it cruises at high speed with little friction to contend with, and whether you’re going 100 feet or 50 miles you only have to take off once. So University of Michigan researchers thought there might be a sweet spot where taking a flying car might actually save energy. Turns out there is… kind of. The team published their results today in Nature Communications. The U-M engineers made an efficiency model for both ground transport and for electric vertical take-off and landing (VTOL) aircraft, based on specs from aerospace companies working on them. “Our model represents general trends in the VTOL space and uses parameters from multiple studies and aircraft designs to specify weight, lift-to-drag ratio and battery-specific energy,” said study co-author Noah Furbush in a U-M news release. They looked at how these various theoretical vehicles performed when taking various numbers of people various distances, comparing energy consumed. As you might imagine, flying isn’t very practical for going a mile or two, since you use up all that energy getting to altitude and then have to come right back down. But at the 100-kilometer mark (about 62 miles) things look a little different. For a 100 km trip, a single passenger in a flying car uses 35 percent less energy than a gas-powered car, but still 28 percent more than an electric vehicle. In fact, the flying car is better than the gas one starting at around 40 km. But it never really catches up with the EVs for efficiency, though it gets close. Do you like charts? ICEV: Internal combustion engine vehicle; VTOL: Vertical takeoff and landing; BEV: Battery electric vehicle. The vertical axis is emissions. To make it better, they had to juice the numbers a bit bit, making the assumption that flying taxis would be more likely to operate at full capacity, with a pilot and three passengers, while ground vehicles were unlikely to have their average occupancy of 1.5 people change much. With that in mind, they found that a 100 km trip with three passengers just barely beats the per-person efficiency of EVs. That may seem like a bit of a thin victory, but keep in mind that the flying car would be making the trip in likely a quarter of the time, unaffected by traffic and other issues. Plus there’s the view. It’s all theoretical right now, naturally, but studies like this help companies looking to get into this business decide how their service will be organized and marketed. Reality might look a little different from theory, but I’ll take any reality with flying cars. Developments in the self-driving car world can sometimes be a bit dry: a million miles without an accident, a 10 percent increase in pedestrian detection range, and so on. But this research has both an interesting idea behind it and a surprisingly hands-on method of testing: pitting the vehicle against a real racing driver on a course. To set expectations here, this isn’t some stunt, it’s actually warranted given the nature of the research, and it’s not like they were trading positions, jockeying for entry lines, and generally rubbing bumpers. They went separately, and the researcher, whom I contacted, politely declined to provide the actual lap times. This is science, people. Please! 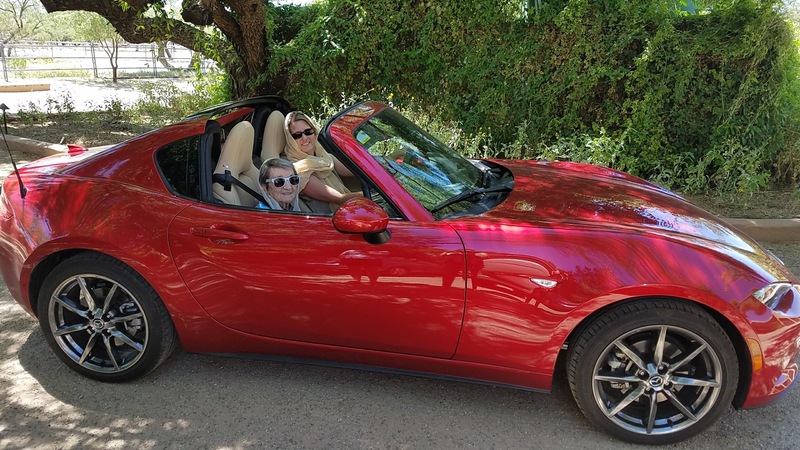 The question which Nathan Spielberg and his colleagues at Stanford were interested in answering has to do with an autonomous vehicle operating under extreme conditions. The simple fact is that a huge proportion of the miles driven by these systems are at normal speeds, in good conditions. And most obstacle encounters are similarly ordinary. If the worst should happen and a car needs to exceed these ordinary bounds of handling — specifically friction limits — can it be trusted to do so? And how would you build an AI agent that can do so? The researchers’ paper, published today in the journal Science Robotics, begins with the assumption that a physics-based model just isn’t adequate for the job. These are computer models that simulate the car’s motion in terms of weight, speed, road surface, and other conditions. But they are necessarily simplified and their assumptions are of the type to produce increasingly inaccurate results as values exceed ordinary limits. Imagine if such a simulator simplified each wheel to a point or line when during a slide it is highly important which side of the tire is experiencing the most friction. Such detailed simulations are beyond the ability of current hardware to do quickly or accurately enough. But the results of such simulations can be summarized into an input and output, and that data can be fed into a neural network — one that turns out to be remarkably good at taking turns. The simulation provides the basics of how a car of this make and weight should move when it is going at speed X and needs to turn at angle Y — obviously it’s more complicated than that, but you get the idea. It’s fairly basic. The model then consults its training, but is also informed by the real-world results, which may perhaps differ from theory. So the car goes into a turn knowing that, theoretically, it should have to move the wheel this much to the left, then this much more at this point, and so on. But the sensors in the car report that despite this, the car is drifting a bit off the intended line — and this input is taken into account, causing the agent to turn the wheel a bit more, or less, or whatever the case may be. And where does the racing driver come into it, you ask? 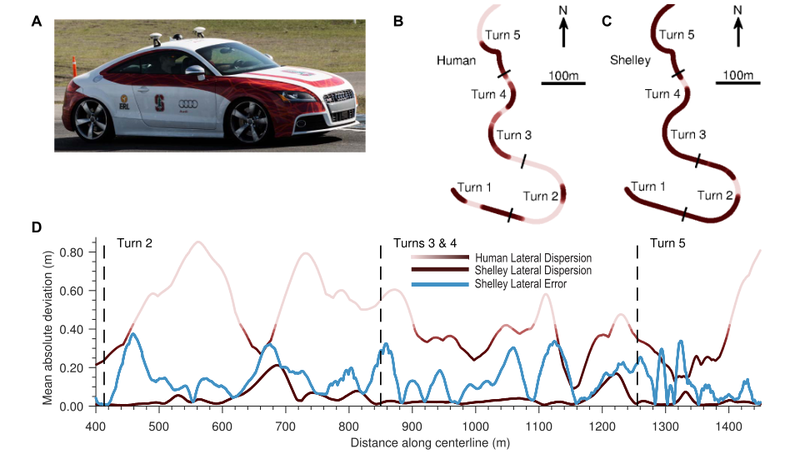 Well, the researchers needed to compare the car’s performance with a human driver who knows from experience how to control a car at its friction limits, and that’s pretty much the definition of a racer. If your tires aren’t hot, you’re probably going too slow. Both the automated vehicle and human participant attempted to complete the course in the minimum amount of time. This consisted of driving at accelerations nearing 0.95g while tracking a minimum time racing trajectory at the the physical limits of tire adhesion. At this combined level of longitudinal and lateral acceleration, the vehicle was able to approach speeds of 95 miles per hour (mph) on portions of the track. Even under these extreme driving conditions, the controller was able to consistently track the racing line with the mean path tracking error below 40 cm everywhere on the track. In other words, while pulling a G and hitting 95, the self-driving Audi was never more than a foot and a half off its ideal racing line. The human driver had much wider variation, but this is by no means considered an error — they were changing the line for their own reasons. Shelley showed far lower variation in its times than the racer, but the racer also posted considerably lower times on several laps. The averages for the segments evaluated were about comparable, with a slight edge going to the human. This is pretty impressive considering the simplicity of the self-driving model. It had very little real-world knowledge going into its systems, mostly the results of a simulation giving it an approximate idea of how it ought to be handling moment by moment. And its feedback was very limited — it didn’t have access to all the advanced telemetry that self-driving systems often use to flesh out the scene. The conclusion is that this type of approach, with a relatively simple model controlling the car beyond ordinary handling conditions, is promising. It would need to be tweaked for each surface and setup — obviously a rear-wheel-drive car on a dirt road would be different than front-wheel on tarmac. How best to create and test such models is a matter for future investigation, though the team seemed confident it was a mere engineering challenge. The experiment was undertaken in order to pursue the still-distant goal of self-driving cars being superior to humans on all driving tasks. The results from these early tests are promising, but there’s still a long way to go before an AV can take on a pro head-to-head. But I look forward to the occasion. While creating self-driving car systems, it’s natural that different companies might independently arrive at similar methods or results — but the similarities in a recent “first of its kind” Nvidia proposal to work done by Mobileye two years ago were just too much for the latter company’s CEO to take politely. 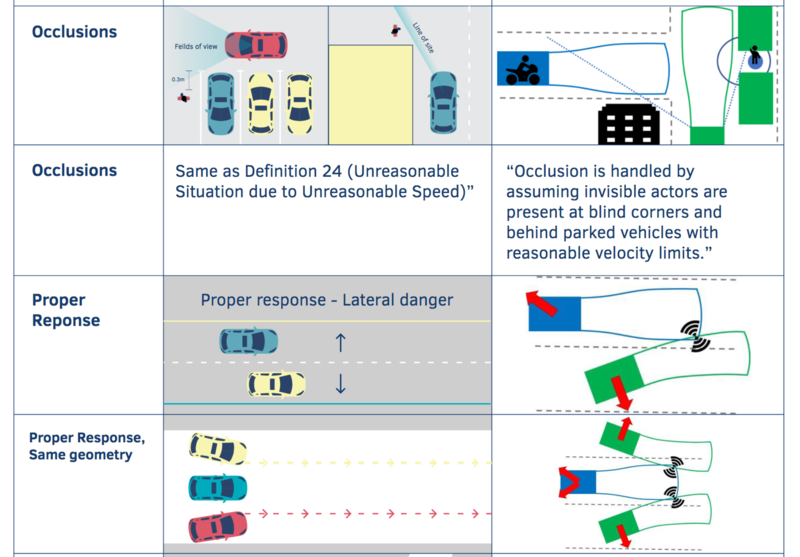 Amnon Shashua, in a blog post on parent company Intel’s news feed cheekily titled “Innovation Requires Originality, openly mocks Nvidia’s “Safety Force Field,” pointing out innumerable similarities to Mobileye’s “Responsibility Sensitive Safety” paper from 2017. It is clear Nvidia’s leaders have continued their pattern of imitation as their so-called “first-of-its-kind” safety concept is a close replica of the RSS model we published nearly two years ago. In our opinion, SFF is simply an inferior version of RSS dressed in green and black. To the extent there is any innovation there, it appears to be primarily of the linguistic variety. Now, it’s worth considering the idea that the approach both seem to take is, like many in the automotive and autonomous fields and others, simply inevitable. Car makers don’t go around accusing each other of using the similar setup of four wheels and two pedals. It’s partly for this reason, and partly because the safety model works better the more cars follow it, that when Mobileye published its RSS paper, it did so publicly and invited the industry to collaborate. Many did, and as Shashua points out, including Nvidia, at least for a short time in 2018, after which Nvidia pulled out of collaboration talks. To do so and then, a year afterwards, propose a system that is, if not identical, then at least remarkably similar, and without crediting or mentioning Mobileye is suspicious to say the least. 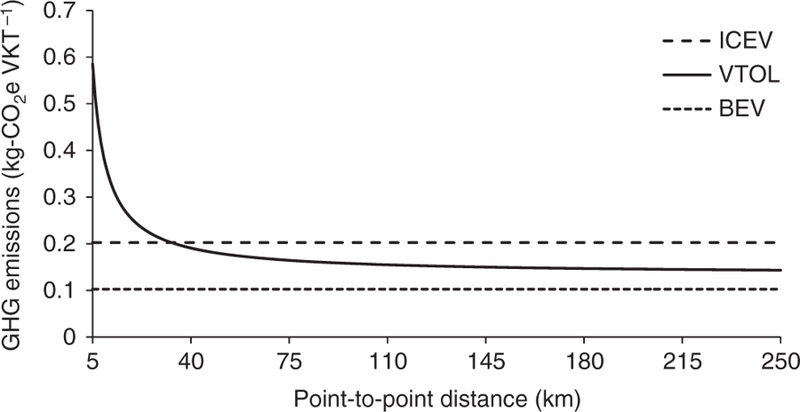 RSS defines a safe longitudinal and a safe lateral distance around the vehicle. When those safe distances are compromised, we say that the vehicle is in a Dangerous Situation and must perform a Proper Response. The specific moment when the vehicle must perform the Proper Response is called the Danger Threshold. This is followed by numerous other close parallels, and just when you think it’s done, he includes a whole separate document (PDF) showing dozens of other cases where Nvidia seems (it’s hard to tell in some cases if you’re not closely familiar with the subject matter) to have followed Mobileye and RSS’s example over and over again. Theoretical work like this isn’t really patentable, and patenting wouldn’t be wise anyway, since widespread adoption of the basic ideas is the most desirable outcome (as both papers emphasize). But it’s common for one R&D group to push in one direction and have others refine or create counter-approaches. Just one problem: This paper doesn’t seem to exist anywhere. It certainly was never published publicly in any journal or blog post by the company. It has no DOI number and doesn’t show up in any searches or article archives. This appears to be the first time anyone has ever cited it. It’s not required for rival companies to be civil with each other all the time, but in the research world this will almost certainly be considered poor form by Nvidia, and that can have knock-on effects when it comes to recruiting and overall credibility. I’ve contacted Nvidia for comment (and to ask for a copy of this mysterious paper). I’ll update this post if I hear back. Pretty much every self-driving car on the road, not to mention many a robot and drone, uses lidar to sense its surroundings. But useful as lidar is, it also involves physical compromises that limit its capabilities. 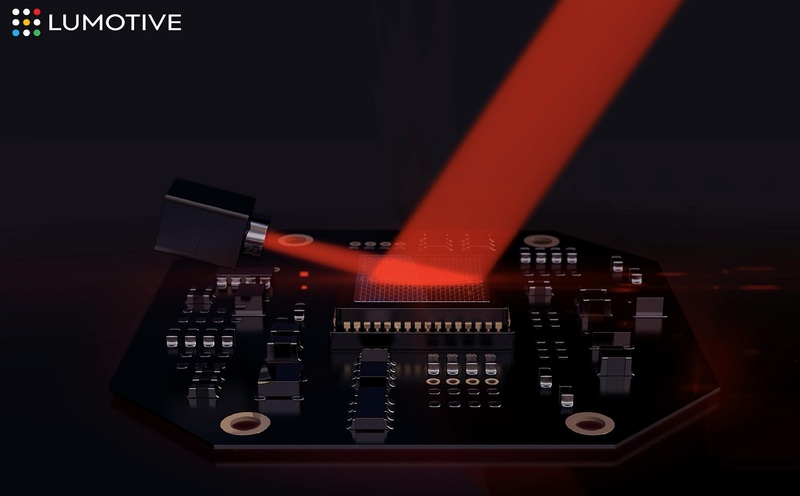 Lumotive is a new company with funding from Bill Gates and Intellectual Ventures that uses metamaterials to exceed those limits, perhaps setting a new standard for the industry. The company is just now coming out of stealth, but it’s been in the works for a long time. I actually met with them back in 2017 when the project was very hush-hush and operating under a different name at IV’s startup incubator. If the terms “metamaterials” and “Intellectual Ventures” tickle something in your brain, it’s because the company has spawned several startups that use intellectual property developed there, building on the work of materials scientist David Smith. Metamaterials are essentially specially engineered surfaces with microscopic structures — in this case, tunable antennas — embedded in them, working as a single device. Echodyne is another company that used metamaterials to great effect, shrinking radar arrays to pocket size by engineering a radar transceiver that’s essentially 2D and can have its beam steered electronically rather than mechanically. The principle works for pretty much any wavelength of electromagnetic radiation — i.e. you could use X-rays instead of radio waves — but until now no one has made it work with visible light. That’s Lumotive’s advance, and the reason it works so well. Lidar basically works by bouncing light off the environment and measuring how and when it returns; this can be accomplished in several ways. Flash lidar basically sends out a pulse that illuminates the whole scene with near-infrared light (905 nanometers, most likely) at once. This provides a quick measurement of the whole scene, but limited distance as the power of the light being emitted is limited. 2D or raster scan lidar takes an NIR laser and plays it over the scene incredibly quickly, left to right, down a bit, then does it again, again and again… scores or hundreds of times. Focusing the power into a beam gives these systems excellent range, but similar to a CRT TV with an electron beam tracing out the image, it takes rather a long time to complete the whole scene. Turnaround time is naturally of major importance in driving situations. 1D or line scan lidar strikes a balance between the two, using a vertical line of laser light that only has to go from one side to the other to complete the scene. This sacrifices some range and resolution but significantly improves responsiveness. The main problem with the latter two is that they rely on a mechanical platform to actually move the laser emitter or mirror from place to place. It works fine for the most part, but there are inherent limitations. For instance, it’s difficult to stop, slow or reverse a beam that’s being moved by a high-speed mechanism. If your 2D lidar system sweeps over something that could be worth further inspection, it has to go through the rest of its motions before coming back to it… over and over. This is the primary advantage offered by a metamaterial system over existing ones: electronic beam steering. In Echodyne’s case the radar could quickly sweep over its whole range like normal, and upon detecting an object could immediately switch over and focus 90 percent of its cycles tracking it in higher spatial and temporal resolution. The same thing is now possible with lidar. Imagine a deer jumping out around a blind curve. Every millisecond counts because the earlier a self-driving system knows the situation, the more options it has to accommodate it. All other things being equal, an electronically steered lidar system would detect the deer at the same time as the mechanically steered ones, or perhaps a bit sooner; upon noticing this movement, it could not just make more time for evaluating it on the next “pass,” but a microsecond later be backing up the beam and specifically targeting just the deer with the majority of its resolution. Just for illustration. The beam isn’t some big red thing that comes out. Targeted illumination would also improve the estimation of direction and speed, further improving the driving system’s knowledge and options — meanwhile, the beam can still dedicate a portion of its cycles to watching the road, requiring no complicated mechanical hijinks to do so. Meanwhile, it has an enormous aperture, allowing high sensitivity. In terms of specs, it depends on many things, but if the beam is just sweeping normally across its 120×25 degree field of view, the standard unit will have about a 20Hz frame rate, with a 1000×256 resolution. 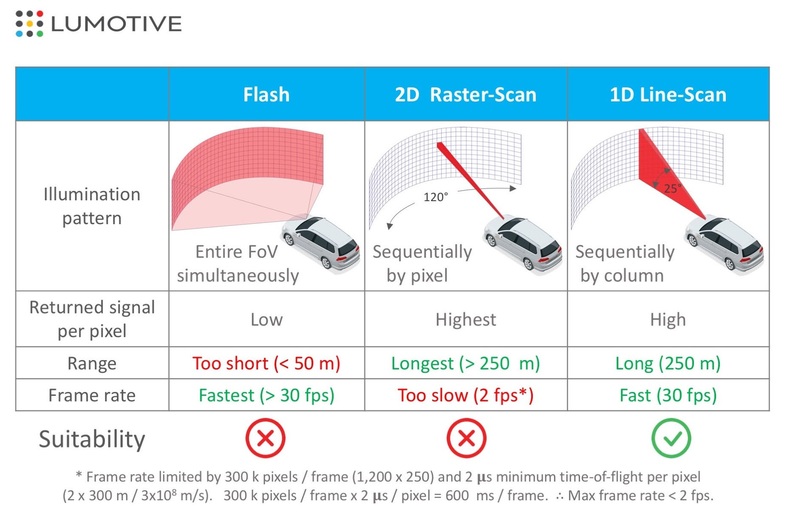 That’s comparable to competitors, but keep in mind that the advantage is in the ability to change that field of view and frame rate on the fly. In the example of the deer, it may maintain a 20Hz refresh for the scene at large but concentrate more beam time on a 5×5 degree area, giving it a much faster rate. Naturally one would assume that such a system would be considerably more expensive than existing ones. Pricing is still a ways out — Lumotive just wanted to show that its tech exists for now — but this is far from exotic tech. The team told me in an interview that their engineering process was tricky specifically because they designed it for fabrication using existing methods. It’s silicon-based, meaning it can use cheap and ubiquitous 905nm lasers rather than the rarer 1550nm, and its fabrication isn’t much more complex than making an ordinary display panel. An additional bonus of the metamaterial basis is that it works the same regardless of the size or shape of the chip. 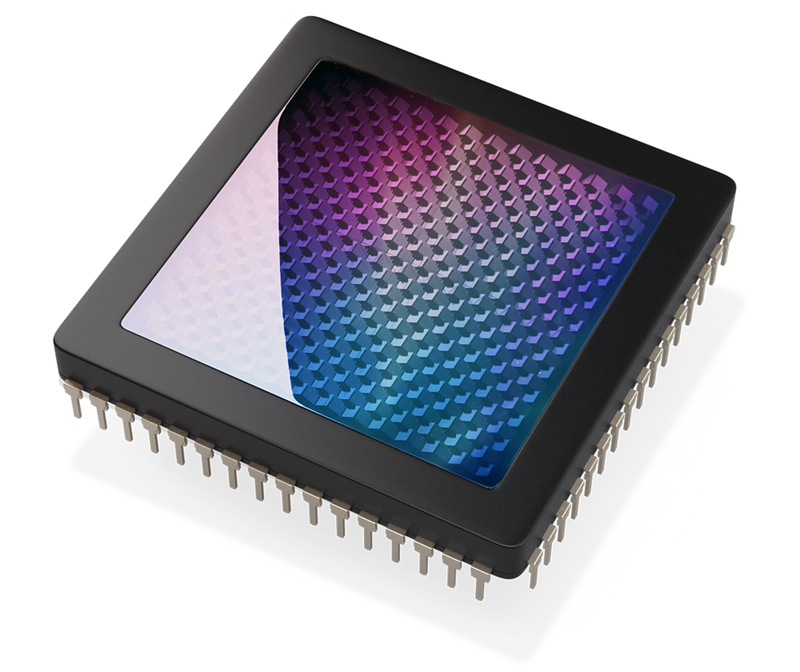 While an inch-wide rectangular chip is best for automotive purposes, Akselrod said, they could just as easily make one a quarter the size for robots that don’t need the wider field of view, or a larger or custom-shape one for a specialty vehicle or aircraft. The details, as I said, are still being worked out. Lumotive has been working on this for years and decided it was time to just get the basic information out there. “We spend an inordinate amount of time explaining the technology to investors,” noted CEO and co-founder Bill Colleran. He, it should be noted, is a veteran innovator in this field, having headed Impinj most recently, and before that was at Broadcom, but is perhaps is best known for being CEO of Innovent when it created the first CMOS Bluetooth chip. Right now the company is seeking investment after running on a 2017 seed round funded by Bill Gates and IV, which (as with other metamaterial-based startups it has spun out) is granting Lumotive an exclusive license to the tech. 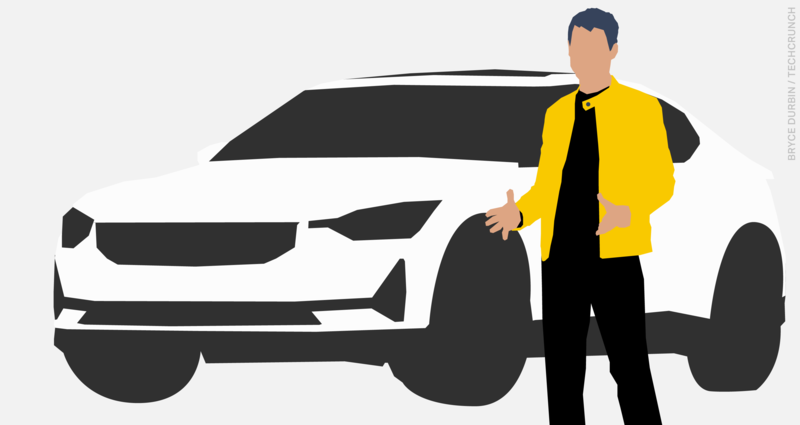 There are partnerships and other things in the offing, but the company wasn’t ready to talk about them; the product is currently in prototype but very showable form for the inevitable meetings with automotive and tech firms. Welcome back to Transportation Weekly; I’m your host Kirsten Korosec, senior transportation reporter at TechCrunch . This is the fourth edition of our newsletter, a weekly jaunt into the wonderful world of transportation and how we (and our packages) move. This week we chat with Polestar CEO Thomas Ingenlath, dig into Lyft’s S-1, take note of an emerging trend in AV development, and check out an experiment with paving. Oh, and how could we forget Tesla. Never heard of TechCrunch’s Transportation Weekly? Catch up here, here and here. As I’ve written before, consider this a soft launch. Follow me on Twitter @kirstenkorosec to ensure you see it each week. (An email subscription is coming). There are OEMs in the automotive world. And here, (wait for it) there are ONMs — original news manufacturers. (Cymbal clash!) This is where investigative reporting, enterprise pieces and analysis on transportation lives. This week, we’re featuring excerpts taken from a one-on-one interview with Polestar CEO Thomas Ingenlath. 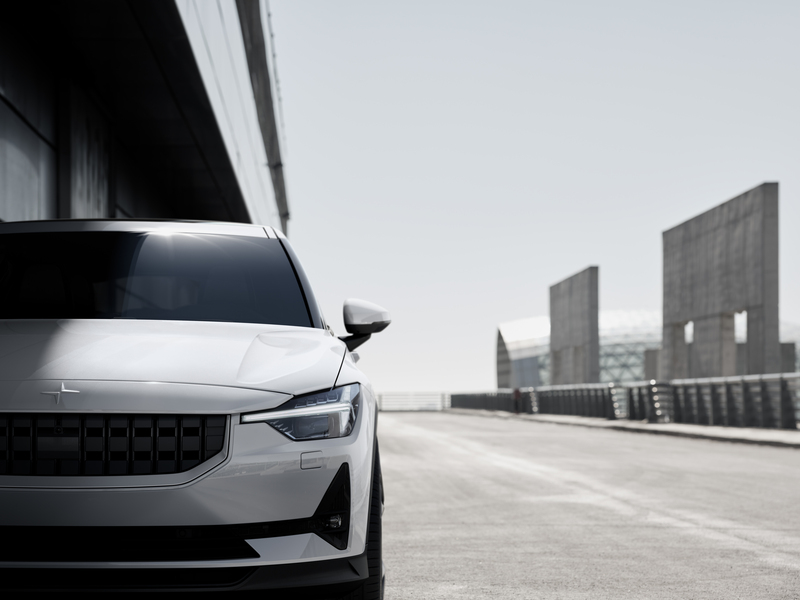 On February 27, Volvo’s standalone electric performance brand Polestar introduced its first all-electric vehicle, a five-door fastback called the Polestar 2. The EV, which has a 78 kWh battery pack and can travel 275 miles (estimated EPA guidance) on a single charge, will be manufactured at a new factory in Chengdu, China. 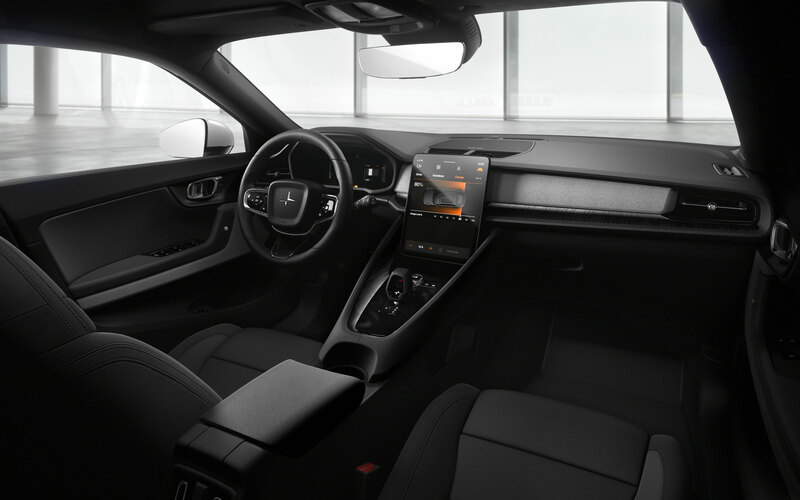 Other notable specs: The infotainment system will be powered by Android OS, Polestar is offering subscriptions to the vehicle, and production starts in 2020. To be very unpolitical, I think it would be totally stupid if we were to aim to develop electric charging infrastructure on our own or for our brand specifically. If you join the electric market today, of course, you would see partnerships; that’s sensible thing to do. Car companies together are making a big effort in getting out a network of necessary charging stations along the highway. That’s what we’re doing; we’re teaming up and have the contracts being designed and soon signed. The terminology is important for us. We very clearly put that into a different picture, we’re not talking about, and we clearly do not ever want to label it, an “autopilot.” The focus of this system is a very safe distance control, which brakes for you and accelerates for you, and of course, the lane keeping. This is not about developing an autopilot system, it is about giving your safety. And that’s where we don’t want to provoke people thinking that they have full rollout autopilot system there. But it is a system that helps you being safe and protected on the road. I also reached out to Transportation Weekly readers and asked what they wanted to know and then sent some of those questions to Ingenlath. TW Reader: How did it feel taking one of your personal styling elements – the C shaped rear lamps – from your previous brand over to Polestar? Ingenlath: It’s an evolutionary process. Polestar naturally builds on its “mothers” DNA and as a new branch develops its own personality. Thor’s hammer, the rear light signature -—with each new model launch (Volvo and Polestar) those elements diverge into a brand specific species. TW Reader: How much do you still get to do what you love, which is design? Ingenlath: Being creative is still my main job, now applied on a broader scope — trying to lead a company with a creative and brand building mindset. Still, I love the Fridays when I meet up with Robin and Max to review the models, sketches and new data. We really enjoy driving the design of both brands to new adventures. Tesla is finally going to offer customers a $35,000 Model 3. How the automaker is able to sell this electric vehicle at the long-awaited $35,000 price point is a big piece of that story — and one that some overlooked. In short, the company is blowing up its sales model and moving to an online only strategy. Tesla stores will close or be converted to “information centers” and retail employees will be laid off. But this is not what we’re going to talk about today. Tesla has also brought back its so-called “full self-driving” feature, which was removed as an option on its website last year. Now it’s back. Owners can opt for Autopilot, which has automatic steering on highways and traffic-aware cruise control, or FSD. FSD capability includes several features such as Navigate on Autopilot that is supposed to guide a car from a highway on-ramp to off-ramp, including navigating interchanges and making lane changes. FSD also includes Advanced Summon, Auto Lane Change, and Autopark. Later this year, the system will recognize and respond to traffic lights in more complex urban environments, Tesla says. Which begs the obvious question, and one that I asked Musk during a conference call on Thursday. “Isn’t it a problem that you’re calling this full self-driving capability when you’re still going to require the driver to take control or be paying attention?” (I also wanted to ask a followup on his response, but the moderator moved onto the next reporter). “We are very clear when you buy the car what is meant by full self driving. It means it’s feature complete, but feature complete requiring supervision. As we get more — we really need billions of miles, if not maybe 10 billion sort of miles or kilometers on that order collectively from the fleet — then in our opinion probably at that point supervision is not required, but that will still be up to regulators to agree. So we’re just very clear. There’s really three steps: there’s being feature complete of full self driving that requires supervision, feature complete but not requiring supervision, and feature complete not requiring supervision and regulators agree. In other Tesla news, the National Transportation Safety Board is investigating a crash, that at first glance seems to be similar to the fatal crash that killed Tesla owner Joshua Brown. In cooperation with the Palm Beach sheriff’s office, the NTSB is sending a team of three to conduct a safety investigation of the commercial motor vehicle and Tesla crash in Delray Beach, FL. We hear a lot. But we’re not selfish. Let’s share. It’s no secret that Pittsburgh is one of the hubs of autonomous vehicle development in the world. But what’s not so widely known — except for a group of government and company insiders — is that Mayor William Peduto is on the verge of issuing an executive order that will give more visibility into testing there. The city’s department of mobility and infrastructure is the central coordinator of this new executive order that aims to help guide testing and policy development there. The department is going to develop guidelines for AV testing, we’re told. And it appears that information on testing will be released to the public at least once a year. Got a tip or overheard something in the world of transportation? Email me or send a direct message to @kirstenkorosec. 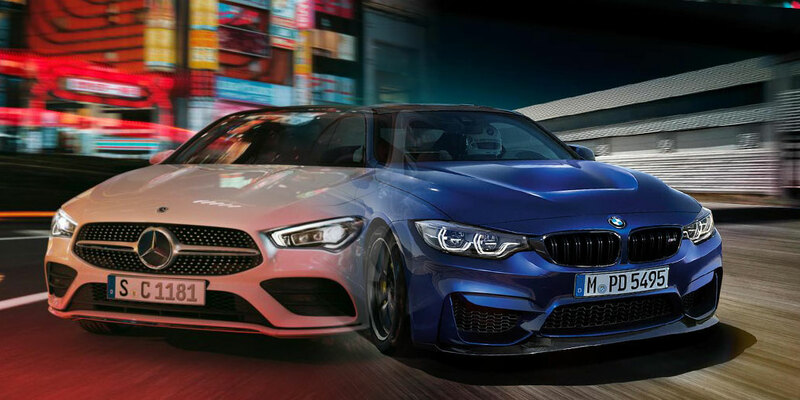 Daimler and BMW are supposed to be competitors. And they are, except with mapping (both part of the HERE consortium), mobility services (car sharing, ride-sharing), and now the development of highly automated driving systems. The deal is notable because it illustrates a larger trend that has emerged as the AV industry hunkers down into the “trough of disillusionment.” And that’s consolidation. If 2016, was the year of splashy acquisitions, then 2019 is shaping up to be chockfull of alliances and failures (of some startups). Also interesting to note, and one that will make some AV safety experts cringe, both companies are working on Level 3 driving automation, a designation by the SAE that means conditional driving automation in which multiple high levels of automation are available in certain conditions, but a human driver must be ready to take over. This level of automation is the most controversial because of the so-called “hand off” problem in which a human driver is expected to take control of the wheel in time. Speaking of partnerships, another deal that got our attention this week involved New York-based mapping and data analytics startup Carmera and Toyota Research Institute-Advanced Development. TRI-AD is an autonomous drive unit started by Toyota with Denso and Aisin. TRI-AD’s mission is to take the research being done over at the Toyota Research Institute and turn its into a product. The two companies are going to test a concept that will use cameras in Toyota test vehicles to collect data from downtown Tokyo and use it to create high definition maps for urban and surface roads. TRI-AD considers this the first step towards its open software platform concept known as Automated Mapping Platform that will be used to support the scalability of highly automated driving, by combining data gathered from vehicles of participating companies to generate HD maps. AMP is new and has possible widespread implications at Toyota. And TRI-AD is full of A-listers, including CEO James Kuffner, who came from the Google self-driving project and Nikos Michalakis, who built Netflix’s cloud platform, and Mandali Khalesi, who was at HERE. Read more on Khalesi and the Toyota’s open source ambitions here. Snapshot this week is a bit untraditional. It’s literally a snapshot of myself and my grandmother, months before her 100th birthday. Her memorial service was held Saturday. She died at 101. She loved cars and fast ones, but not so much driving them. And every time I got a new press car, we’d hit the road and she’d encourage me to take the turns a bit faster. She also loved road trips and in the 1920s, her father would drive the family on the mostly dirt roads from New Jersey to Vermont and even Canada. In her teens, she loved riding in the rumble seat, a feature found in a few vehicles at the time including the Ford Model A. She was young at heart, until the very end. Next week, we’ll focus on the youngest drivers and one automotive startup that is targeting that demographic. 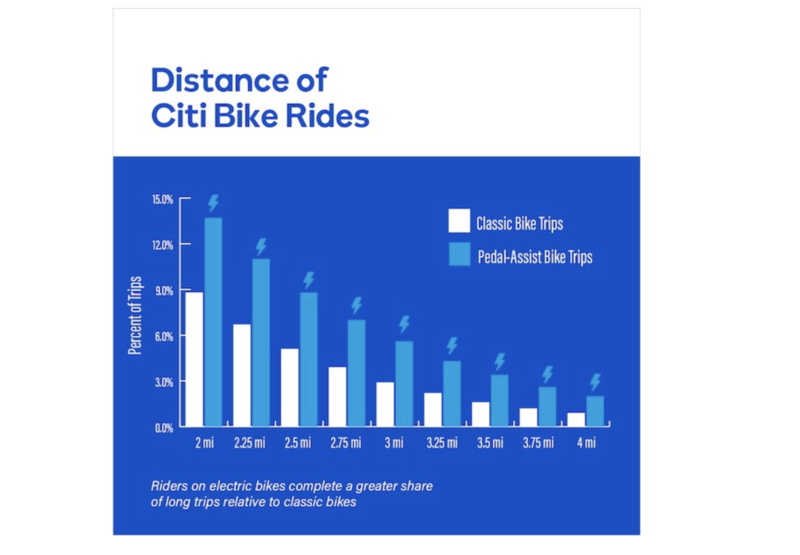 Lyft, which bought bike-share company Motivate back in July, also released some data about its electric pedal-assist bikes this week, showing that the pedal assist bikes are, unsurprisingly, more popular than the traditional bikes. They also traveled longer distances and improved winter ridership numbers. 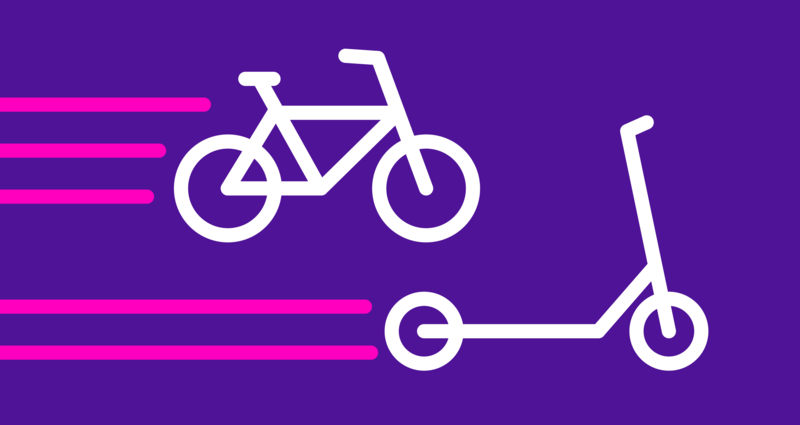 Now, Lyft is gearing up to deploy 4,000 additional electric bikes to the Citi Bike system in New York City. Google Maps has added a feature that lets users see Lime scooters, pedal bikes and e-bikes right from the transit tab in over 80 new cities around the world. Users can click the tab to find out if Lime vehicle is available, how long it’ll take to walk to the vehicle, an estimate of how much their ride could cost, along with total journey time and ETA. If take the time to read anything this week (besides this newsletter), spend some time with Lyft’s S-1. The ride-hailing company’s prospectus mentions autonomous 109 times. In short, yeah, it’s something the company’s executives are thinking about and investing in. The company’s primary investors are Rakuten with a 13 percent stake, GM with 7.8 percent, Fidelity with 7.7 percent, Andreessen Horowitz with 6.3 percent and Alphabet with 5.3 percent. GM and Alphabet have business units, GM Cruise and Waymo respectively, that are also developing AV technology. Through Lyft’s partnership with AV systems developer and supplier Aptiv, people in Las Vegas have taken more than 35,000 rides in Aptiv autonomous vehicles with a safety driver since January 2018. Check out the Pedestrian Traffic Fatalities by State report, a newly released report from Volvo Car USA and The Harris Poll called The State of Electric Vehicles in America. Again, deployments doesn’t always mean the latest autonomous vehicle pilot. These individual precast concrete slabs are movable and permeable, can light up and give off heat. The idea is that these hexagonal-shaped slabs and be used to clear snow and ice in trouble spots and light up to warn drivers and pedestrians of changes to the street use or to illuminate an area for public uses or even designate bike lanes and hazard zones. And because they’re permeable they can be used to absorb stormwater or melted snow and guide it to underground stormwater management systems. Sidewalk Labs tell me that the pavers have “plug and play” holes, which allow things like bike racks, bollards, and sign posts to be inserted. Sidewalk Labs initially built these with wood, and the new prototype is the next iteration, featuring modules built from concrete. There is a lot of transportation-related activity this month. The Geneva Motor Show: Press days are March 5 and March 6. Expect concept, prototype and production electric vehicles from Audi, Honda, Kia, Peugeot, Pininfarina, Polestar, Spanish car company Hispano Suiza, and Volkswagen. SXSW in Austin: TechCrunch will be at SXSW this coming week. Here’s where I’ll be. 2 p.m. to 6:30 p.m. March 9 at the Empire Garage for the Smart Mobility Summit, an annual event put on by Wards Intelligence and C3 Group. The Autonocast, the podcast I co-host with Alex Roy and Ed Niedermeyer, will also be on hand. 9:30 a.m. to 10:30 a.m. March 12 at the JW Marriott. The Autonocast and founding general partner of Trucks VC, Reilly Brennan will hold a SXSW podcast panel on automated vehicle terminology and other stuff. 3:30 p.m over at the Hilton Austin Downtown, I’ll be moderating a panel Re-inventing the Wheel: Own, Rent, Share, Subscribe. Sherrill Kaplan with Zipcar, Amber Quist, with Silvercar and Russell Lemmer with Dealerware will join me. TechCrunch is also hosting a SXSW party from 1 pm to 4 pm Sunday, March 10, 615 Red River St., that will feature musical guest Elderbrook. RSVP here. Finally, I’ve been in contact with Joshua Schachter who puts on the annual Self Racing Car event, which will be held March 23 and March 24 at Thunderhill Raceway near Willows, California. There is still room for participants to test or demo their autonomous vehicles, drive train innovation, simulation, software, teleoperation, and sensors. Hobbyists are welcome. Sign up to participate or drop them a line at contact@selfracingcars.com. Thanks for reading. There might be content you like or something you hate. Feel free to reach out to me at kirsten.korosec@techcrunch.com to share those thoughts, opinions or tips. Ford is partnering with what3words to give drivers access to the startup’s novel addressing system. Under the partnership, drivers will be able to connect to the free what3words app — on an iOS or Android device — to their vehicle via their SYNC 3 infotainment platform. Drivers can find the three-word address on website contact pages, guidebooks and business cards. Drivers can enter the addresses via voice or text input and receive directions through the vehicle’s navigation system. The startup, founded in 2013, has divided the entire world into 57 trillion 3-by-3 meter squares and assigned three words to each one. Users of the what3words app, which is available in 26 languages, has been adopted by logistics, travel, automotive and humanitarian organizations because it provides exact locations anywhere in the world. The system is used by Lonely Planet, which has rolled out three-word addresses for each of its listings, as well as Mercedes-Benz, ride-hailing app Cabify, the UN, Red Cross and TomTom. The startup has also attracted an interesting mix of investors, most recently Sony’s venture capital arm. And last year, Daimler took a 10 percent stake in what3words, following an announcement in 2017 to integrate the addressing system into Mercedes’ new infotainment and navigation system — called the Mercedes-Benz User Experience, or MBUX. MBUX is now in the latest Mercedes A-Class and B-Class cars and Sprinter commercial vehicles. “We are more mobile than ever before, but with that comes its challenges. The growing traction that what3words is gaining within the automobility industry is a testament to how we are improving journeys and customer experiences,” CEO and co-founder Chris Sheldrick said. What3words will initially be available to Ford owners in the U.K. and Ireland, Germany, Spain, the U.S. and Mexico. More markets and languages will follow later in the year. The addressing system can be downloaded for free on iOS and Android.